For the first time ever I can say I have killed the biggest buck I have had on camera all year. This particular buck showed up last season as what I felt like was a slightly above average 3 year old 9 with good tines. 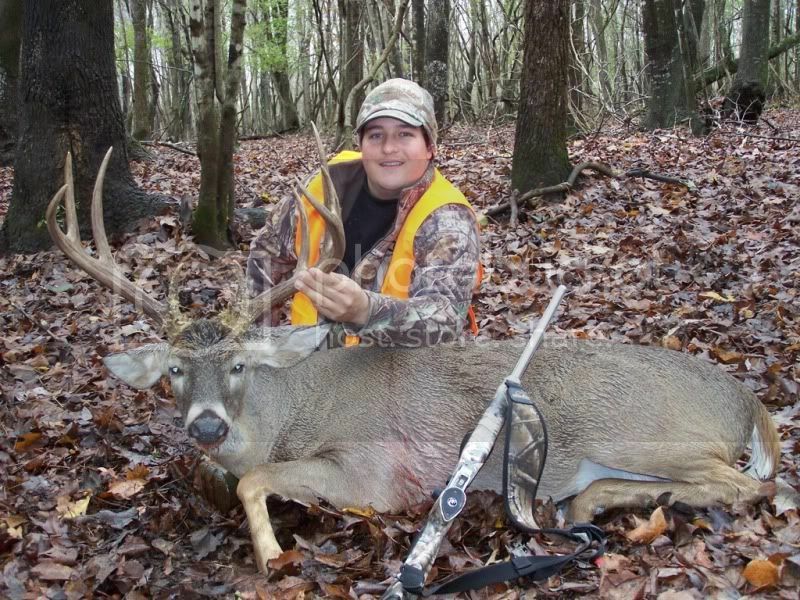 I got many pics of him over December and January and saw him one time hunting. I knew he had potential but honestly didn't think he would end up as good as he did in one year. Dad found his sheds while discing my bean field and we at least knew he made it that far and I never gave him much thought until I finally moved a camera back in the area in September. 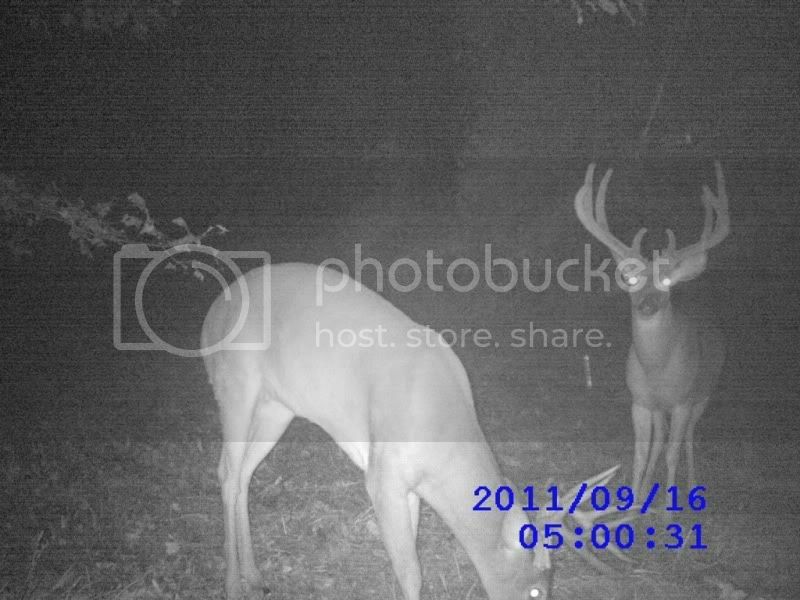 The first time I checked the camera there he was, a big wide nine with an awesome frame. I recognized the similaritys immediately and figured it was him. I didn't really know how good he truly was because after this pic and about 3 more taken at the same time I never got him again. I left the camera on the same tree until the end of October and he never came back so I figured it was a fluke and figured he would be a deer I would never see. Then 3-4 weeks ago my white oaks started dropping and I set a camera on one of the trees after 2 weeks I pulled the card and had one picture of him passing by at 4 am. This was certainly encouraging and I knew he was at least still in the area. Today I was scheduled off of work and havent really been seeing alot but with the northwest winds i knew I was gonna head over and sit the area where I had the pics of the big nine. It's a fairly large block of hardwoods with a powerline cut through it with some small fields intertwined and planted in ag wheat. I was running about 5-10 minutes later than I would have liked. It was super muddy and the long walk and being late had me hustling and not really paying attention trying to get to the tripod. Well I must have literally been staring at the ground because I look up and catch something to my right in some cut cotton stalks that definitely shouldn't be there. I look to see two deer and immediately knew the one in the back was a buck. I raised my binos and big nine is with a doe staring at me in a wide open field. I eased down the binos and started up with my 35 whelan and as usual right before I got it to my shoulder the doe bolted and he went with her. I thought this to be a now or never type situation and as he got a little broadside running away I let a shot ring out. At the shot the buck disappeared giving me about .5 seconds of Oh My GOD I Got Him! This immediately left my mind as he popped out across the ditch he was on and headed into a dried up slough in the block of hardwoods. I thought from the sound and the way he acted that I may have hit him and I started towards where he went into the woods to possibly look for sign of a hit. But as I thought about I told myself you should go on to the tripod because of he isn't hit, and headed into those woods, he is going to cross that pipeline. So on that I Mach 9"d it to the tripod to at least wait an hour. As I got to the ladder a see a deer cross where they so often do, I threw up the binos and there he is no worse for wear fast walking across the pipeline. There was no chance at a shot and I knew now that I had missed. Fortunately for me due to years of hunting this spot I knew that normally when deer cross there they end up crossing the narrow ag field in front and drop into another set of hardwood ridges on the other side. I knew that was my last chance and I also knew it was an absolute coin flip as to whether he would even go that direction. I went on and set my gun on the rail and got everything ready with my focus glued to the major crossing point about 200 yards down. After about 10 minutes, to my utter disbelief he stepped out on one of the closest trails he could have at around 120 yards. He trotted out into the field and I was afraid he was gonna run out of my life but he stopped half way across and I buried the cross hairs on him and let the whelan speak. He ran low and hard out of the field and left me questioning whether I hit or missed. I waited about 30 minutes and finally slipped down. I walked the field edge hoping to either see a deer dead in the woods or a massive blood trail. I thinky nerves were working me over because I saw neither and then let that sneaky little word doubt creep into my mind. I took some deep breathes got my bearings and located his running track in the field and immediately saw blood spray on the sandy ground. 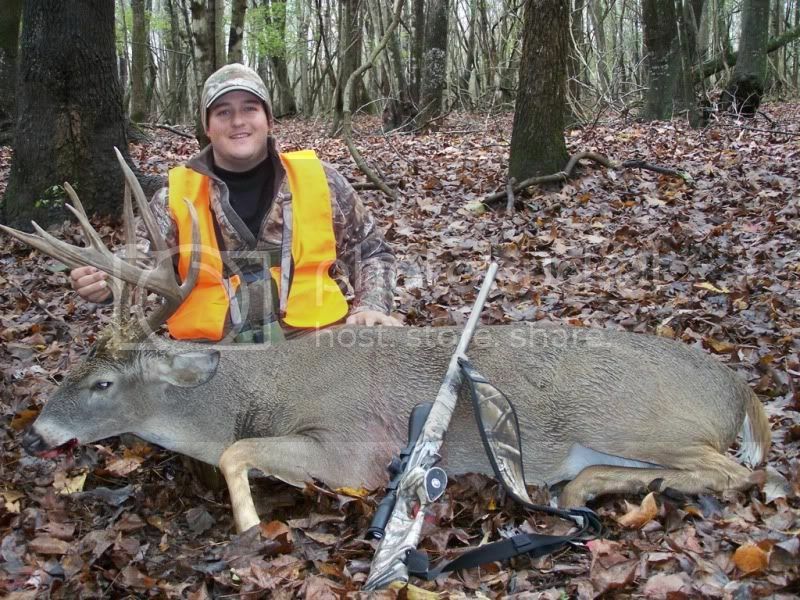 It ended up being a constant yet nerve-racking 140-150 yards blood trail but at the end there he lay. For once the deer was truly bigger than I even thought. 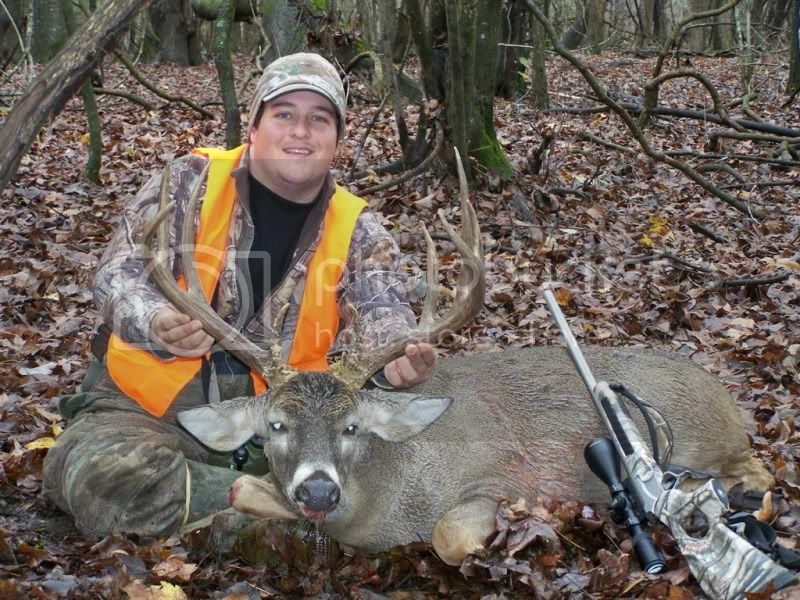 He is big 9 point with 5 1/8 bases and a 20 inch even inside spread. He tapes 149 1/8 as a nine and has a 1 1/8 inch kicker off the base that puts him at 150 2/8 gross. That makes him the second best buck of my career. It didn't happen in Kansas but good ol Mississippi never fails me and I'm truly thankful to get not one but two chances at this buck this morning and get the job done.